The first and forthright comment I can give about The Amplifires’ music is: it is very digestible, and a wide spectrum of music listeners can enjoy their songs; it pans in between Alternative Rock and Punk, with all the classic shades added to it. From Blondie to Ramones, and even Jim Morrison at times, so there is something for young listeners, as well as old trained ears of the 70’ and 80’ era. Songs are short, crispy and punchy. You wouldn’t need to leave some out to a make a play list as they all appropriately melt into one another, although the lyrical (or conceptual) content varies. Like all great Alternative outfits, rhythm section is providing a solid ground for the punchy guitar work over it, but my interest lies in the beautiful (and natural) tone of the vocalist Sharon Clancy. She has a gifted voice, and in my opinion, she could have picked any genre and her voice would have adjusted to it; it has a certain feel to it. No wonder a huge number of listeners are drawn to it. That also explains the growing number of followers for The Amplifires, on the both sides of Atlantic. The UK based band (Matlock to be precise) was found in 2005, when David Brunt (guitarist) and Steve Rawlinson (bassist) accidentally met and realized that they have some common interests (in terms of music) shortly they were joined by Sharon Clancy (vocalist) and an improvisation of Blondie’s ‘Call me’ led to the solidification of the act. There had been quite a few replacements on the drums, but currently Sandy Mitchell is holding the seat; and he is holding it steady. 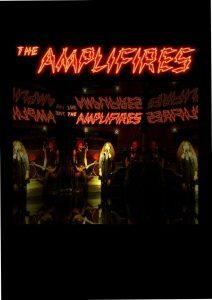 The Amplifires has been quite active ever since: the first album ‘Fire On The Moon’ was released in 2008, followed by ‘S.W.A.L.K’, 18 month later. Their latest album ‘Grace and Danger’/Life’s a Gamble’ has been released, available both on musicxray.com and reverbnation.com, as well as on apple’s itunes. And the new fans looking for a chance to hear them live can check their performances on youtube.